Warm up this holiday season with a mug of rich and delicious Boozy Peppermint Hot Chocolate! I have included 3 different ways to make the perfect cocktail. Heat milk, brown sugar, and cocoa in a medium saucepan over medium-low heat until bubbles start to form around the edges. Add the chopped chocolate chunks and stir until the chocolate is completely melted. Remove from heat and stir in the vodka and peppermint schnapps. 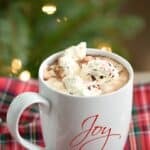 Pour into mugs and top with your favorite whipped topping and garnish with chocolate shavings and crushed candy canes. The double-chocolate hot cocoa was the weakest of the three. It had almost not chocolaty flavor. The chocolate syrup would be my second choice. It had more flavor, but still wasn’t quite perfect. Top with Coconut Whipped Cream or any other dairy-free whipped topping like SoyWhip or RiceWhip. To make your whipped topping fancy, place in a small zipper top plastic bag with a decorative tip and pipe it over the hot chocolate in a swirling pattern. I was too lazy, I just plopped it right on top. Let’s call it “rustic”. If peppermint isn’t your thing, substitute Baileys for the vodka and schnapps. That is my second favorite, especially after skiing all day! For an alcohol-free version, skip the vodka and schnapps…then I would start with 1 teaspoon of peppermint extract and 1 teaspoon of vanilla extract in place of the peppermint schnapps, or 2 Tablespoons of Peppermint Simple Syrup and adjust based on your personal preference.